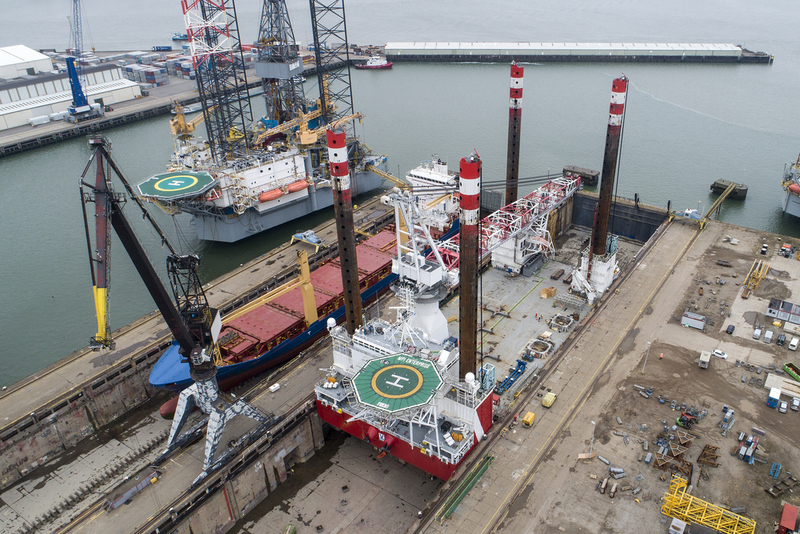 Damen Verolme Rotterdam (DVR) has completed a refit project on the MPI Enterprise, a 120-metre, self-elevating, DP2, wind turbine installation vessel owned and operated by MPI Offshore, part of the Vroon Group. The works included the installation of spudcans on her four-legged jacking system, which can elevate the vessel at rate of one metre per minute in water depths up to 45 metres. Acquired by Damen Shipyards Group in June 2017, DVR is one of the largest refit and repair yards in Western Europe, capable of accommodating any seagoing vessel or floating offshore unit. Fitting new spudcans on each of the four legs was a major enterprise, with 16 tensioning bolts per spudcan. The new spudcans were lowered into the drydock using the onboard crane and then each was moved into position by self-propelled modular transporters. Mechanical linkage in spudcan design is unusual, and the advanced design was implemented using shim plates to divert radial and torsional movement from the tensioning bolts. This was appreciated by the client as a true achievement. The new spudcans increase the load-bearing area when the vessel is jacked up and so reduce the penetration into the seabed. The MPI Enterprise departed DVR in early April to work on offshore wind farms in the North and Baltic seas. As part of the Damen Shipyards Group, DVR is looking to take advantage of its strategic location and exceptional facilities to expand its activities into new sectors. With its 405 x 90 metre drydock it is actively developing its capability in cruise ship repair and modification by developing relationships with specialist sub-contractors and suppliers. In addition, it is refining its logistics and project management processes to better manage the increasing role that yards are expected to play in the repair and maintenance of these luxury vessels. Servicing LNG Carriers is another area in which it is adding resources. The yard is also certified for decommissioning and is in discussions with a number of oil and gas operators with assets in the North Sea.